Citation: C N Trueman "The Pilgrimage of Grace"
The Pilgrimage of Grace is the title given to a widespread revolt against the rule of Henry VIII. The Pilgrimage of Grace started in late 1536 and finished in early 1537. Much is known about this revolt as it was well documented at the time. Between late 1536 and 1537 a number of revolts against the king took place in Northern England. These were collectively known as the ‘Pilgrimage of Grace’. However, strictly, the Pilgrimage of Grace only refers to the revolt that occurred in Yorkshire between October and December 1536. The first of the uprisings occurred in Lincolnshire in October 1536 and lasted about two weeks – from the 2nd to the 18th. While it did not last long, the revolt did represent a major threat to the government. This was because those in the rebellion were not just the ‘common’ people. Nobles were also involved in the Lincolnshire Uprising – a group of people whom the government had usually been able to rely on to support it. There is some evidence that some nobles may even have orchestrated the uprising – but others were forced to join it on pain of death. The king could not use local militia to quell the uprising because it was feared that they would join the rebels. Therefore, troops had to be brought in from other areas of the kingdom. By about October 5th, it is thought that 40,000 men were involved in the uprising. They marched to Lincoln. Contemporary documents show that they were well disciplined and orderly and certainly not a rabble. They received a decent welcome from the people of Lincoln. But once it the city, things started to go wrong. Those nobles in the uprising realised – rather late – that they had much to lose. The Duke of Suffolk was heading towards Lincoln with an army and the chances of defeating it were slim at best. They took the first opportunity they were given to withdraw themselves from the rebels. Suffolk, as was almost a tradition, gave all the rebels the opportunity to return home without bloodshed and gave a promise that Henry would look into some of the policies that had angered them. The nobles seized their chance, as did many of the commoners. Those who wanted to take on Suffolk remained in Lincoln but the numbers of the rebels had been severely reduced. 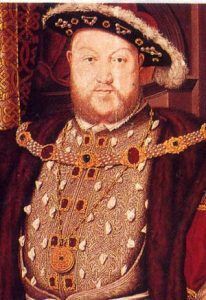 Henry had previously ordered that no mercy was to be shown to those who had dared to show disloyalty to the king. There seems to be little doubt that those who remained in Lincoln would have paid with their lives. But almost immediately Henry was faced with a far more serious rebellion in Yorkshire, which postponed any immediate punishment of the Lincolnshire rebels. The Yorkshire Uprising – the Pilgrimage of Grace – was very similar to the one in Lincolnshire. ‘Commoners’ made up the bulk of the numbers while nobles were also in its ranks. However, one major difference was that the Yorkshire rebels were well led. Robert Aske, an able lawyer from an important Yorkshire family, became the accepted leader of the Yorkshire rebels. A skilled orator, Aske was also a very competent organiser. He wanted the rebellion to maintain the highest of standards so that no one could call the men he led a rabble. He did not want to frighten away more nobles from joining the rebellion. It was Aske who coined the phrase ‘Pilgrimage of Grace’ to describe their actions. This term, it is thought, was deliberately chosen. Pilgrims came from the word pilgrimage and this was the holy slant that Aske wanted to put on the rebellion. He wanted Henry to stop his attacks on the Church and the monasteries and return the country to following the Pope. Aske believed that Henry himself was not at fault as he was thought to be a decent and well-meaning king. Aske lay the blame on ‘evil’ advisors, especially Thomas Cromwell, whom he believed were polluting the king’s mind. Aske believed that once Henry saw the rebellion for what it was – a spiritual pilgrimage – he would revert to old policies and remove from power those who had mislead the king. However, to reinforce that the rebels had the means to gain what they wanted, the ‘pilgrims’ had a well-organised armed force at their disposal. All those who took part in the rebellion had to take an oath regarding their behaviour and overall demeanour. For those who took this oath, it was binding and any failure to maintain it would lead to eternal damnation. The support for Aske was widespread in Yorkshire. Men also joined from Durham, Northumberland and some from Lancashire. With a few exceptions, most of the rebels behaved very well. They gathered at York and then at Pontefract. There was a royal castle at Pontefract, which garrisoned 300 royal troops. It fell without firing a shot. In fact, the castle was in a poor state of repair and it is very likely that it could not have held out for a day let alone anymore time. Henry suspected the castle’s leader, Lord Thomas Danby, of being sympathetic to the rebels and that the 300 men in the garrison, likewise, were far from loyal. But the fact that it was a royal castle gave the rebels in Yorkshire a major boost in terms of confidence. Pontefract Castle surrendered on October 21st. At this stage, the so-called Pilgrims numbered 35,000 men. They were well armed and well equipped. Henry ordered the Duke of Norfolk and the Earl of Shrewsbury north to confront the rebels. However, both men could only raise about 8,000 men so they would have been heavily outnumbered in battle. The one advantage they had was the fact that Aske did not want conflict. He still wanted a negotiated settlement and as a result Norfolk met Aske at Doncaster Bridge on October 27th. Norfolk came across as a sympathiser of the rebel demands and he persuaded them to disband while a deputation of them would be escorted to London by Norfolk himself. What they may not have known was that Norfolk was a political rival of Thomas Cromwell and used whatever opportunity he had to undermine Cromwell’s position – and the rebels gave Norfolk a perfect opportunity to continue his campaign against Cromwell. The deputation of rebel envoys did not include any major leader. Aske remained in Yorkshire to ensure that the rebels organisation maintained itself if the king failed to deliver. However, Henry was a clever politician. He received the rebel demands – but failed to give a reply to them for several weeks. In this time he hoped that the rebel organisation would start to show weaknesses. It would be a tall order for Aske to keep all 35,000 men organised. Henry bought more time by asking the pilgrim envoys to clarify certain points that he failed to fully understand. He suggested that the leaders should meet up to construct a clearly written and detailed set of demands. At the same time Norfolk was ordered to end the rebellion in whatever way he thought necessary. The rebel leaders duly met in Pontefract in early December to construct what became known as the ’24 Articles’. The nobles among the pilgrims produced these and they did not represent the majority in the rebellion – the poor commoners who were not invited to attend the meeting. Nine of the demands were specifically religious while six were specifically political. The rest were a combination of social, political, economic and religious issues. 1) The king would received the demands. 2) A freely elected Parliament would discuss them. 3) All pilgrims would be pardoned for their part in the rebellion. Aske and the 300 other rebel leaders at Doncaster believed that they had won a great victory. He travelled to London at the king’s request to meet Henry who had asked to be briefed about the feelings of the people so that any future problems could be avoided. Aske saw this as a sign that the king was a decent person and that it was advisors who were failing the country. In fact, Henry was simply buying time. He had already determined that the north had to be taught a military lesson. However, he wanted from Aske as many names as was possible so that individuals could be brought to account. In late January 1537, Aske returned to Yorkshire where he became a vocal supporter of Henry. Others were suspicious that the promised pardon had yet to arrive. At the same time it had become apparent to Norfolk that Henry would judge him by the way he put down the rebellion. Norfolk had feared that Henry had believed that he was sympathetic to the rebel demands and that now he needed to show above all else his loyalty to the king. Norfolk used a rebellion in Cumberland (February 1537) as the reason for his campaign even though the pilgrims had condemned what had happened in Cumberland. By now the pilgrims were in disarray while the army of Norfolk was poised to strike when it chose to do so. With no chance of successfully fighting Norfolk’s army, the leaders of the Pilgrimage of Grace agreed to Henry’s order that they should come to London to answer questions. By early May, fifteen of the main leaders were under arrest despite the promise of a pardon. Two juries were established in Yorkshire to decide whether the men should stand trial in London. The juries were made up of the friends of those arrested. This process was known as indictment. It was a heartless procedure as those who best knew the likes of Aske and Danby were now asked to essentially sign their death warrants as no trial in London would spare them. All the accused unsurprisingly were found guilty of treason. Most were executed in London but Aske was taken back to Yorkshire where he was executed. This was meant to be a gesture of how much in control of the events Henry was. How much of a threat was the Pilgrimage of Grace to Henry? The king tried to play it off as a minor rebellion in one of the more outlying areas of his kingdom. Few, if anyone, in the royal court would have dared to contradict the king, especially as Henry had crushed the rebellion. However, many historians now consider the rebellion to have been the greatest internal threat that Henry had to face in his reign. They base their judgement on the basis that it would have been very difficult for Henry to have gathered together an army that was big enough to fight against the 35,000 men in the rebellion. There is also no evidence that Henry had anyone capable of handling such a large military force even if he had been able to raise so many men. It is also accepted that anger was not just a preserve of the north. If the rebels had marched south it is almost certain that others would have joined them. Therefore, as the rebels marched south, their numbers may well have grown greatly. There was also the real fear that a foreign nation would use the disruption that the rebels would have caused to attack England in the south. With Henry’s army engaged against the rebels, there would have been little to stop a landing on the Kent/Sussex coast. If the Pope denounced Henry and urged all Catholics to assist the rebels, Henry’s position would have been even weaker. None of the above did happen as the rebels accepted the peace plan put forward by the king. Credit also needs to be given to Henry for the way he handled the representatives of the rebels while they were in London. His delaying tactic worked. Ironically, from a position of great potential weakness, Henry emerged from the Pilgrimage of Grace in a stronger position. The rebels were defeated and anyone else thinking about getting involved in something similar would have known about the consequences. The defeat of the rebels simply showed the populace who held real power and it is no coincidence that the major impact of the Reformation against the monasteries occurred after the Pilgrimage of Grace – in 1538. It was almost as if victory against Aske and his followers spurred Henry to push ahead with his changes; which is what he did. While the rebel army was in existence, they presented Henry with a major problem. The defeat of that same army gave Henry the freedom to move ahead with what he wanted to achieve. Historians have written about ‘what might have happened’ with regards to the Pilgrimage of Grace. It wanted Henry to change his religious policies for a start. Ironically, his victory over the rebels gave him the freedom to implement these changes regardless.